Today was nominally the "first full day" of Westercon 71, on account of there being light programming yesterday and a full schedule from 10 AM today, and therefore by Westercon rules, the programming items that was once called "The Fannish Inquisition" was today; however, apparently some people consider that bit of in-jokey reference offensive for various reasons, so it was just the Westercon and Worldcon (and NASFiC) Bid Presentations, and I was the moderator. I took this picture of the moderately full room a few minutes before we started. By the time we were done, we were near capacity. Ron Oakes (at right, behind camera) helpfully ran the camera. As required, the bid for SeaTac WA (using the Doubletree where Norwescon is held) had the first 15 minutes. After that, since the focus was on bids, not seated conventions, we had presentations and Q&A with New Zealand in 2020 (Worldcon), DC in 2021 (Worldcon) and Utah in 2019 (NASFiC). There was no more time, either for the panel or on the memory stick in the camera, so we were able to finish with time to take down our equipment and clear the room for the 11 AM panel. I went up to the hotel room after the bidder presentations and set the four videos to uploading. Fortunately, the hotel wi-fi is fast enough to where that was not going to take all weekend. I worked out that there was a 7-Eleven store about 1 km away (for me by myself, that's around a 15 minute walk or less), so I headed over there to buy a bit for lunch and also some things for the hotel room refrigerator. By he time I came back and ate my lunch, the videos were finished, aside from me fixing typos on the descriptions. There is a playlist of Westercon 71 Westercon, NASFiC, and Worldcon Bid presentations up on YouTube now if you'd like to see how the four groups represented themselves. 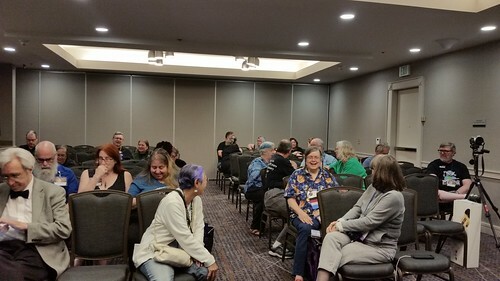 This was a bit of a warm-up for Saturday's Westercon Business Meeting, the first session of which is scheduled for 11 AM in the same room as where the bidding presentations were held. Ron has helpfully agreed to run the camera here again as well. Had this year's meeting been like the last several, with only the pro forma presentation of the site selection results, I probably would have just started the camera myself, done the meeting, then shut if off myself. However, this year, we have four pieces of new bylaws business, and possibly a fifth proposal that was hinted to me a couple of days ago. If the debate goes long enough, it's possible that we'll need to go to the "overflow" session scheduled in a much larger room later in the day. We will, however, start the Business Meeting on Saturday with the Site Selection results before going into the new proposals, and we'll see how much people actually want to debate them. I spent some time this afternoon sitting behind the Worldcon 76 San Jose table, after earlier having helped set up the table. (I'm useful setting up the tall display sign because I can reach it at full extension.) I did a run through the dealers' room — I must restrain myself from buying anything due to lack of luggage space. And I cast my and Lisa's Westercon site selection ballots. Because we forgot to have Lisa fill out a ballot to bring with me, her vote was cast for No Preference so it can't affect the results. At 6 PM, it was time for the formal Opening Ceremonies. 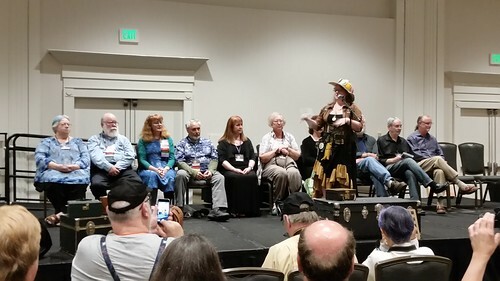 A group of Worldcon 76 team members (easily visible by our green shirts) sat in the back row as Westercon 71 chair Nikki Ebright started the Opening Ceremony of Westercon 71 before turning it over to MC David Gerrold, who introduced the Guests of Honor. After the Opening Ceremonies, I asked where the ceremonial Gavel of Westercon was, and she admitted that she hadn't brought to the Opening, so there was no opportunity to do a ceremonial gavel drop. She did promise to get the Gavel to me in time for Saturday's Business Meeting, however, and I will then return it in time to hand it over to next year's Westercon committee at the Closing Ceremonies. Dinner was very nice and unhurried at McCormick & Schmick's, where I got to have dinner with friends and with someone I don't think a much younger me would ever have expected to share a meal with. My thanks to lindadee for inviting him to join us. It was a good meal with good company. And much to my surprise, the mac & cheese and the key lime pie didn't send my blood sugar skyrocketing. This may be related to having logged something like 13K steps today. There are parties this evening, including the memorial for the late Harold Harrigan and for Westercon 71. I won't be out much later though, even though I don't have any commitments on Friday and therefore need not get up that early. I can let my two roommates rise before me and for a wonder, sleep in tomorrow if I want to do so.